With the New Year, we’ve been looking back at the past to try to come up with some good New Year’s Resolutions. Making resolutions generally means looking for what’s less-than-ideal in our lives and formulating plans to change things. While most people examine themselves, we can also examine our living situations. Continuing, good resolutions are generally rooted in careful detailed examinations of the past, and being willing to drop previous preconceptions, instead seeing thing as they are, through the lens of the data of our personal and shared histories. Unfortunately, in retrospective, the realities of the past few economic years do not offer very promising pictures for the broad economic futures of US Middle Class folks, like myself and our children. Looking back, we find two very different economic stories from the past few decades. reased by 11.6 percent for the wealthiest 1% households. So, the Big Lies that Reagan told, and the Big Lies that the Right keeps telling: Claiming that rewarding the rich with lower taxes turns into them creating more jobs are just that: Big Lies, told over and over…. e.g. Mitt Romney never really created jobs… (except for day-traders and take-over artists). He did manipulate trades and deals to get himself a bankroll of $250 million, with $50 million a year in “investment” returns, while paying only 14.7% taxes vs. 27% Federal taxes paid by Middle Class individuals who actually work and who actually produce things. Does it really make sense to tax the rich (top 2%’ers) at just 17% average net tax payments to the Federal govt, while plumbers, electricians, and common workers pay an average of 27%. ~ In the Clinton era expansion: 45 percent of the annual total personal income gains went to the top 1 percent. ~ In the Bush recovery, the 1%’ers took 65 percent of income gains. ~ Under the tax and investment regulatory rules/policies that Obama inherited: the top 1%’ers gobbled up 93 percent of the total income gains. This is yet more evidence that the Big Lie of the Laffer Curve, the Big Lie of Trickle Down economics, and the Big Lies that we should allow the wealthy to have substantially lower tax rates than the rest of us – Where all of these Big Lies should be rejected by Americans, and rejected by the Tea Partiers and other “no new taxes” believers who have been howling “NO TAX INCREASES” for anyone. Again, the Tea Partiers, Republicans, and Libertarians need to stop supporting the wealthy who have been raiding the public till and the private business tills for the last 30 years. Why not advocate a fair tax system – where we all pay the same rates? To my friends who argue “No New Taxes”: The rich have bought off just enough Right Wing common people (including Tea Partiers) and Right Wing politicians to create 3 decades of systems where ultimately the 1%’ers have rewarded themselves with 93% of the income gains, as Middle Class incomes fall, and Tea Partiers and “No New Taxes” pledgee’s march around under banners proclaiming fairness… Their tax system proposals are horribly out of balance, and getting worse. They build ever larger piles of money, and they do NOT invest it in creating jobs. Follow the money…. Go with the data… Choose reality, over hype and Big Lies…. and….. Choose Ideologies and efforts that actually fit reality. Address the big and real problems, and ignore the media’s (including Limbaugh) chatter about their pet Big Lies. 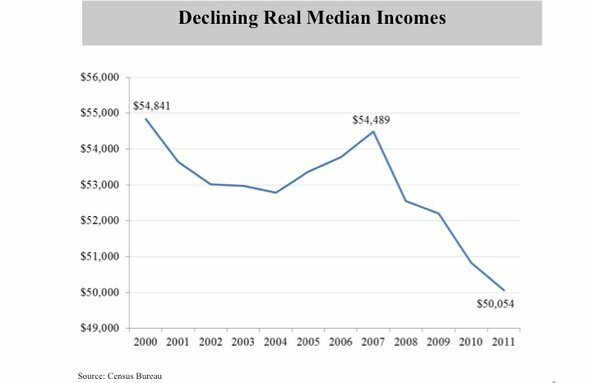 Latest reports show that (ironically) Middle Class income dropped very slightly in 2012, while the latest Bloomberg financial reports that the top 1%’s saw another 22% increase in 2012… on top of their 2011 and 2010 10% annual increases. So what do these decades of data show? 2. the end of the Cold War marks another change. 1. With Reagun’s changes, the pieces were put into place to begin the special rewarding of the rich, while chipping away at the rights of ordinary individuals: Reagun and Bush the 2’nd really chewed into personal freedoms, and both dramatically increased the “police state” qualities in the USA. Note how the curves start to separate during Reagun’s “Greed is Good” era. 2. With these biases set into Govt. policies, when the large economic benefits due to the end of the Cold War kick-in (along with increases in worker productivity due to computers), who got the benefits? Did / Do the worker’s who actually do the work, receive any share of the pie? Or do the rich take the lion’s share of the spoils, as they have taken 93% of the last 4 years of income increases? ~ Caused an unemployment crisis, . . .
and then after causing all this: They reward themselves with years of ever bigger portions of the economic recovery: taking an obscene 93% of the rewards – as they recruit Tea Partiers and other Right Wing middle class people to “defend their rights”…. Resolution: GET THE US TROOPS OUT of Italy, Bosnia, Kosovo, Germany, Afghanistan, Korea et al… Let them solve their own problems. Resolution: Stop spending 100’s billions on the US Navy to keep cheap oil supplies flowing to China, Japan, Korea, Indonesia, and Taiwan. There will also be $250 billion spent on interest to pay the debt, which makes roughly $3 trillion total of 2013 federal spending on the US Military, pensions, Health Care, and Debt service, out of $3.8 Trillion total. With the existing 120,000 military personnel in friendly safe countries of Germany, England, Japan, and Italy; with between 700 – 1,200 overseas military installations in over 75% of the world’s countries, do reasonable people believe that military cuts are not possible or reasonable? Even if we completely eliminated US federal health care spending ($900 billion), we cannot balance the budget without cutting the Military or raising taxes. As pointed out in the article above, Middle Class folks have been paying an average of 58% higher tax rates than the wealthy (2%’ers) for roughly a decade – which could mean it is time for the wealthy to pay their fair share or … cut Military spending. Should have been titled, how to lie with statistics. You know there is no truth to an argument when it is based on statistics. Losers always say “someone pushed me” while winners say I fell. If you want to earn more then get the skills that pay more instead of complaining that you don’t make enough because the rich are manipulating the system. If you don’t like what the entrepreneurs of this country earned who got rich during the Clinton years, try doing your own startup and see why they made so much. Since you have no facts to support your opinions, you fall back to the childish singsong “nah, nah, nah, nah” of claiming that I used statistics. You fail to note that the numbers I report are based on counting – NOT AT ALL on statistical manipulations. If there are 100 men in a room, and we count them – that is not statistics – it is counting – something typical 6 year olds can do. If there are 100 jellybeans, and one man takes 93 of the beans, then there are only seven left for the other 93 men to split. ~ Under the BUSH CHENEY PAULSON tax and investment regulatory rules/policies that Obama inherited: the top 1%’ers gobbled up 93 percent of the total income gains. REALITY? I have done 2 “start-ups” – as you call them. I prefer to call them businesses…. For example: I and another fellow started and built an 80 person laboratory business during the Clinton years, and operated it until 2003. Your imagination and the pitiful lies you write far outstrips facts. Is someone who builds a laboratory, that gets awarded the HIGHEST ratings on blind Performance Tests for 7 years – best in the USA over that period- and generates over $44 million and makes payroll for 80 people for 8 years – somehow a “LOSER” ??? Where have I complained? You don’t bring a single fact to the dialogue – and you only heap on complaints and hurl false childish accusations in reply to facts. Please try to bring some “game” to the game, before writing in public again…. How many jobs did you create and maintain during your career? How much wealth did you create and maintain during your career? How much wealth did you create and pay out in salaries and benefits to employees during your career? Lies and false accusations are weak…. lame…. excuses…. that are no substitute for effort or talent. Were you asleep during 2004 – 2010, when the rich manipulated banking rules and investment rules – allowing 40:1 margin borrowing/lending – and credit default swaps – causing a financial crash that wiped out $7 trillion of wealth ??? Please, drink some coffee, … wake up …, educate yourself…. … read some factual news and factual reports …from sources other than the distorted repetitive pablum peddled on “Fox News” . Why is it that not one single Tea Partier or Right Winger or Republican commentator can make a factual case to support their beliefs – as they write in and spew childish rants, that are based on excuses, lies, and distortions? I am a Centrist… Neither Liberal nor Conservative. To address some of the lies that em>Tea Partiers, Right Wingers, and Republicans are writing, I have started and run 2 fine businesses – both successful – generating on average over $20 an hour for each employee…. These businesses generated over 80 high quality jobs for college grads with productive degrees in Chemistry, Biology, and Geology – versus Mitt Romney’s 20 jobs for “venture capitalist” loan sharks. I started formally working at age 9 – physical labor… I was working 40 hours a week by age 12 as a mechanic (doing brake jobs and other simple tasks as a helper to a fine fine fearless hillbilly) and also as a laborer shovelling stone and blacktop… and pushing a broom. I was a supervisor of a construction crew by age 18. Just where do the bitter, childish, petty Tea Partier or Right Winger or Republican commentators find their imagined “right” to write lame lies about me and other people? Why imagine petty and stupid things about others? Why has not one single Tea Partier or Right Winger or Republican commentator writing-in… brought something substantive or constructive to the financial dialogues here, other than base-less opinions and personal bile ? Really, can just one of your group stand up and articulate something rational and fact-based, on a par with William F. Buckley? The answer to these questions may be “No”, because even Buckley honored good presentations of facts…. Buckley respected other people, even while disagreeing with them.